The publicity given to the 4Cs in a diamond seems to have reached a wide audience. While there are some people who know what the 4Cs are all about, another significantly large group has heard of the 4C criteria but, knows nothing about them. This report should clear many doubts, it talks about the influence that the 4Cs have on diamond pricing. To begin, the 4Cs of a diamond represent the color, clarity, cut and carat (weight) of the stone. When it comes to diamond pricing, the general rule is that better 4Cs yield a better price. Colored diamonds have an interesting twist, the intensity of the color takes precedence over clarity. There could be some subjectivity when defining the 4Cs for a specific diamond. This could at times be deliberate when, sellers overstate the 4Cs to quote a higher price for the stone. Experts agree that a diamond certified from a reputed testing lab, would have its features accurately displayed on the certificate. This is what delivers the term ‘certified’ diamonds. In reality diamond pricing is not totally dependent on the 4Cs, normal market mechanisms do influence the price of the precious stone. Higher demand is likely to push up the price, this upward price movement can be steeper if supply keeps falling way below demand. Conventional diamond trade is carried on, through a supply chain that is characterized by one weakness. Multiple brokers and middlemen place themselves between the seller and the final buyer. These entities keep adding their margins to the price, thus inflating the price of the precious stone. There is a technological solution to improve efficiency in the diamond industry. GLITZKOIN with its diamond blockchain is poised to make that happen. The project includes a diamond exchange named DiaEx. Small and large diamond buyers and sellers from any point on the globe, can trade on the platform. With no middlemen, diamond pricing on this platform is bound to be competitive. Listings on the DiaEx are restricted to certified diamonds, this rules of fakes and misrepresentation of the 4Cs. This report would be incomplete without talking about, the Diamond Price Estimator developed as part of the DiaEx exchange. Backed by powerful algorithms and constantly updated with diamond price trends from across the globe, the price estimator or calculator provides a market price estimate with a variation of just +/- 15%. The best thing about the GLITZKOIN Diamond Price Estimator is that, the tool is open to everyone – at no cost. Users are not obliged to buy or sell diamonds on the DiaEx exchange. Promoted by a second generation diamond veteran, GLITZKOIN has accurately assessed the application of technology for the betterment of diamond trade. 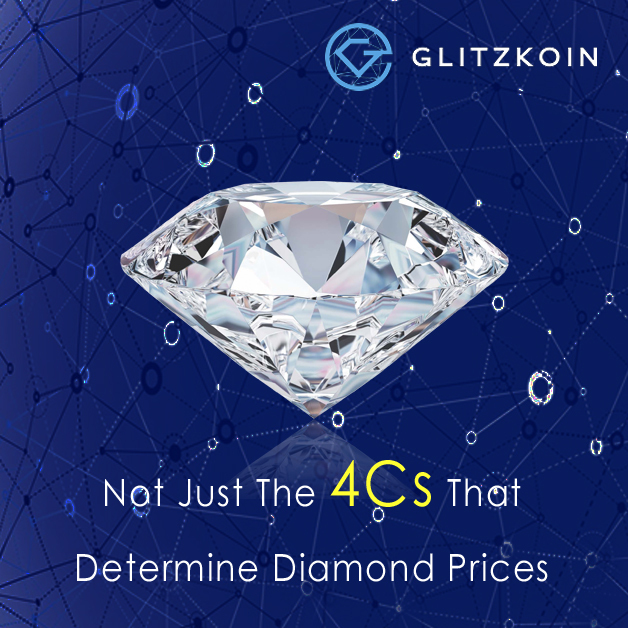 You can access the Diamond Price Calculator (estimator) by visiting the website at www.glitzkoin.com and clicking on the PRICE ESTIMATOR bar. The 4C parameters for the diamond can be input on the next screen.